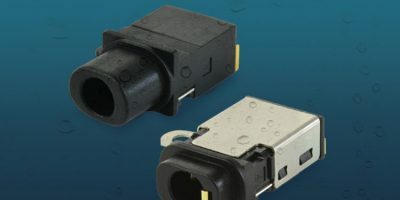 Waterproof audio jack connectors CUI’s Interconnect Group are certified to IP67. The audio jacks are available in surface mount, mid mount surface mount and through hole mounting styles. There is also a choice of right-angle orientations and four conductors. They conform to the 3.5 mm audio standard, adds CUI. The compact form factor and profiles as low as 5.3 mm, mean that the waterproof audio jacks can be used by designers to create a sealed barrier between a device and the environmental contaminants encountered in consumer electronics, mobile, and industrial applications, explains CUI. The waterproof stereo jacks are rated up to 10,000 mating cycles and offer operating temperature ranges up to -30 to +85 degrees C. Depending on the series, the connectors also have shielding, an internal switch, mounting tabs for added stability on the PCB, and reflow solder compatibility. All models comply with RoHS standards and carry a UL94V-0 flammability rating. These IP67 rated audio jacks are available immediately. CUI is an electronic components manufacturer specialising in a range of product technologies, including power electronics, interconnect, audio, motion and thermal management for a range of market segments.